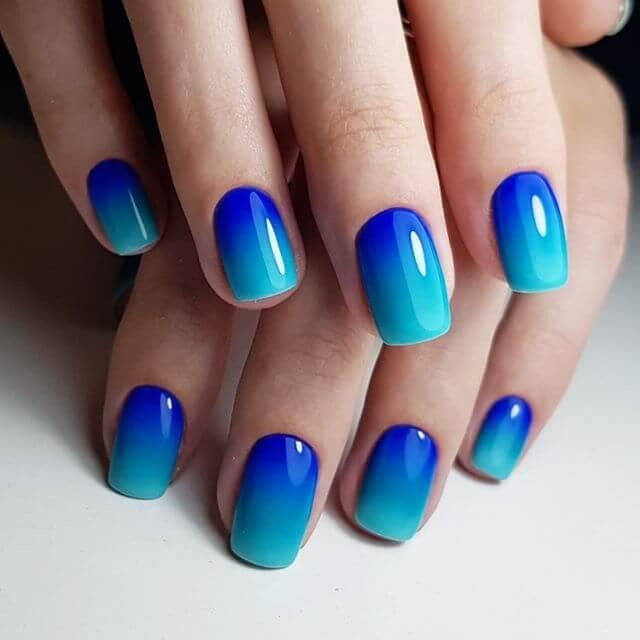 If you are looking to add some color to your nail art, then consider these amazing blue nail designs. Blue can be tranquil and energetic, sweet and sassy, and it can be used to create a nearly limitless variety of looks. When you decide to use blue as your primary nail design color, you are opening yourself up to an incredible amount of possibilities. Having colored nails turns your cuticles into a fun and fashionable accessory that you can work however you choose. Blue is one of the most abundant colors, examples like sapphire, turquoise, aquamarine, and azure help to emphasize that varied and gorgeous blues are all around us. Plus incorporating something a little chilly into your look is just the right seasonal touch. The abundance of blue is probably one of the reasons that the color is so popular, and also nearly universally flattering, nearly everyone looks good in blue, and most people can pull off multiple shades of the color. It works perfectly as an accent color but can also serve as the dominant shade; in other words, it thrives whether it’s in a strong supporting role or taking center stage. 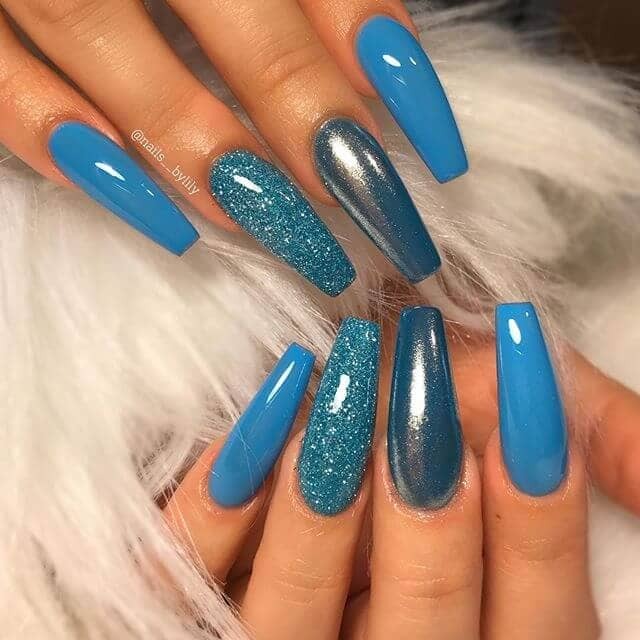 For all these reasons and more, you should consider blue for your next nail design, whether you like sparkly or solid, elaborate or simple, there is a blue nail design for you. 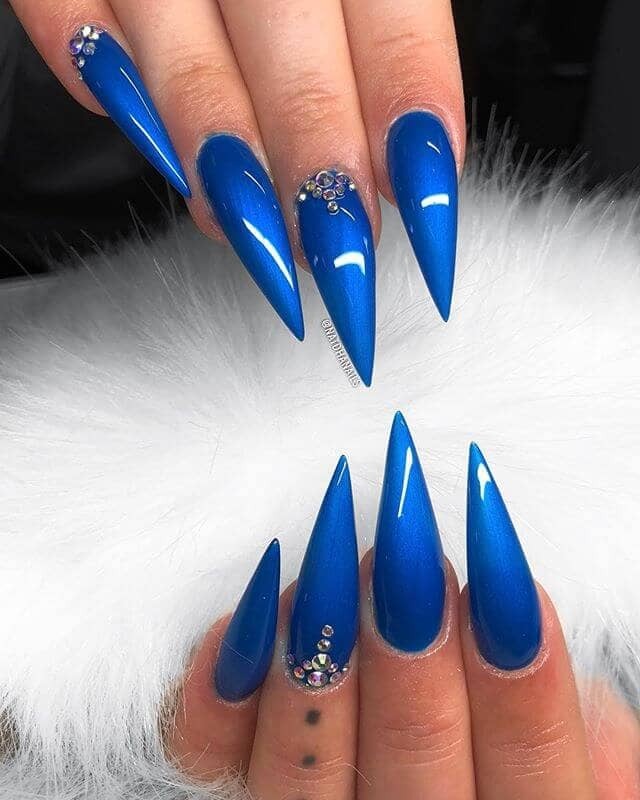 This list features fifty of the coolest and most on point blue nail designs and is a great starting point for your next bold blue look. 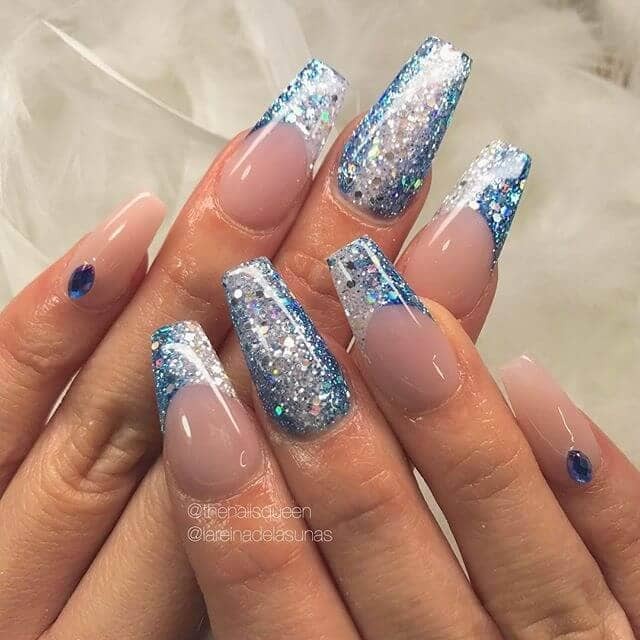 Starting with a brightly full glitter middle nail, then tapering out to a simple single azure gem on the pinky, this look pairs a clear polish that lets the natural nail shine through with playful blue and white glitter, creating a look that is chic with a nod to simplicity. 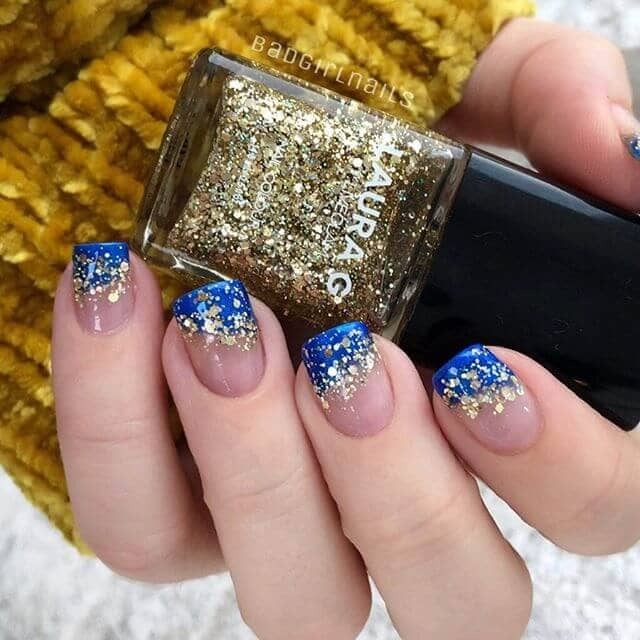 This design hides the stark line that divides the clear polish from the bright blue using flecks and sparkles of beautiful gold confetti polish. This magical dusting of pixie dust not only makes the transition from blue to clear smoother but also adds an element of whimsy and revelry. Blue and gold are a classic and reliably gorgeous combination. 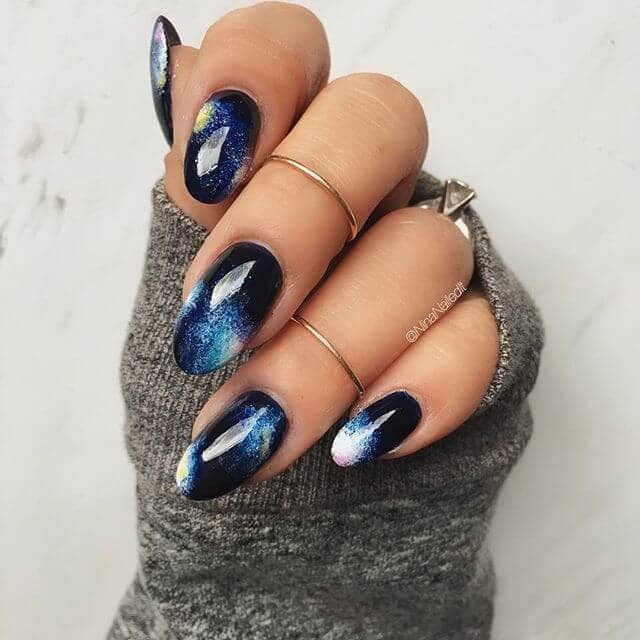 The night sky is one of the best ways to incorporate blue into an artistic nail design, and this particular set pays homage to deep space. 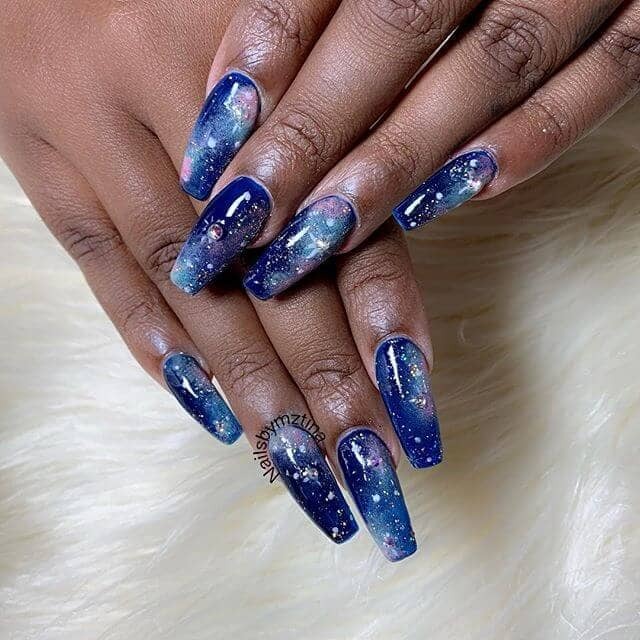 With bursts of yellow and white creating central celestial bodies that explode out into gradually darker blues, each nail is another gorgeous galaxy to explore. 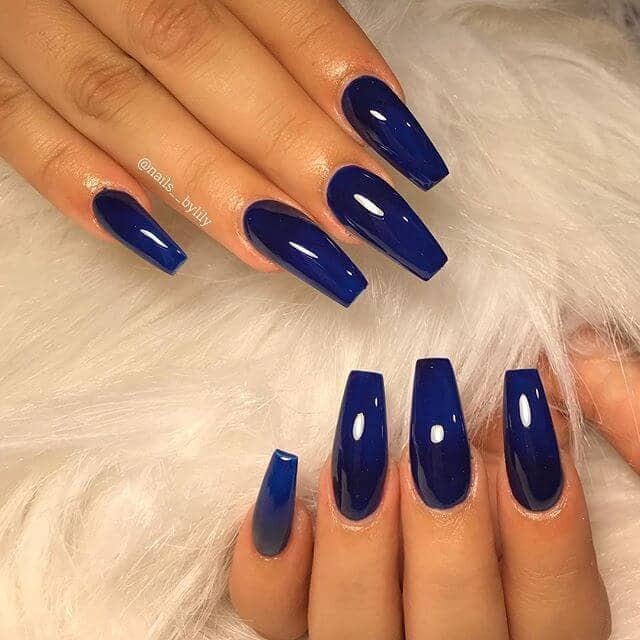 With an air of regality, these smooth and glossy stiletto nails present a soft and welcoming shade of cobalt paired with a powerful and intense stiletto tip that can present the wearer as a friendly but no-nonsense person. Add small diamond rhinestones for a classy and sparkly bit of flair. 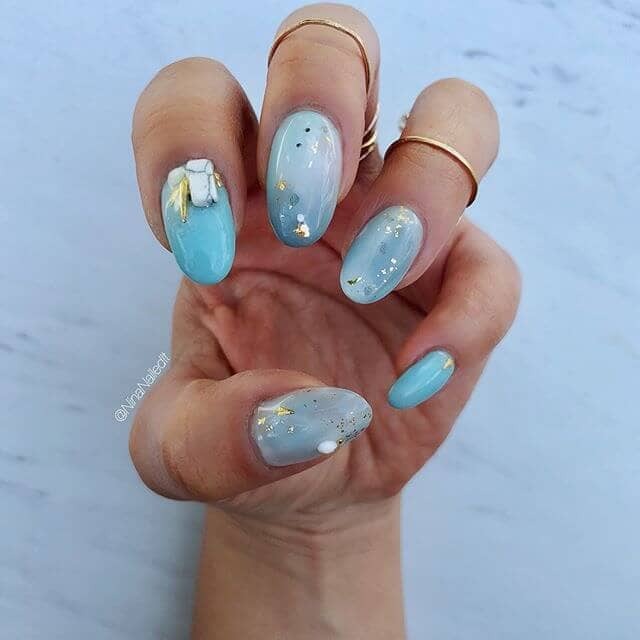 With their minty hue and icy bling, these pretty nails are one of the best blue nail designs. 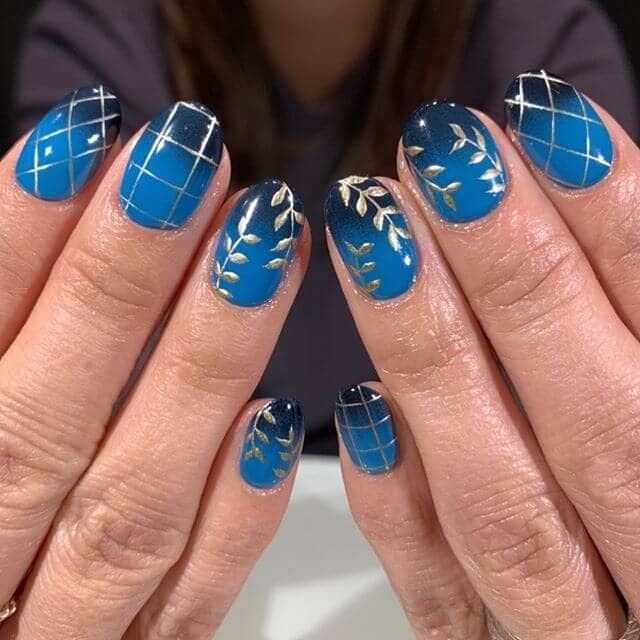 Incorporating fun and appropriate accessories, a lovely shade of blue, and subtle textural differences, these nails hit all of the marks for great nail design. The decision to place the glossy jeweled nails on opposite fingers of each hand is a pleasant variation. Gray and blue have always been a natural combination. They both have a cool quality and blend effortlessly into each other. These nails pair a bright blue with a steely gray that, although they are many shades apart, marry well. 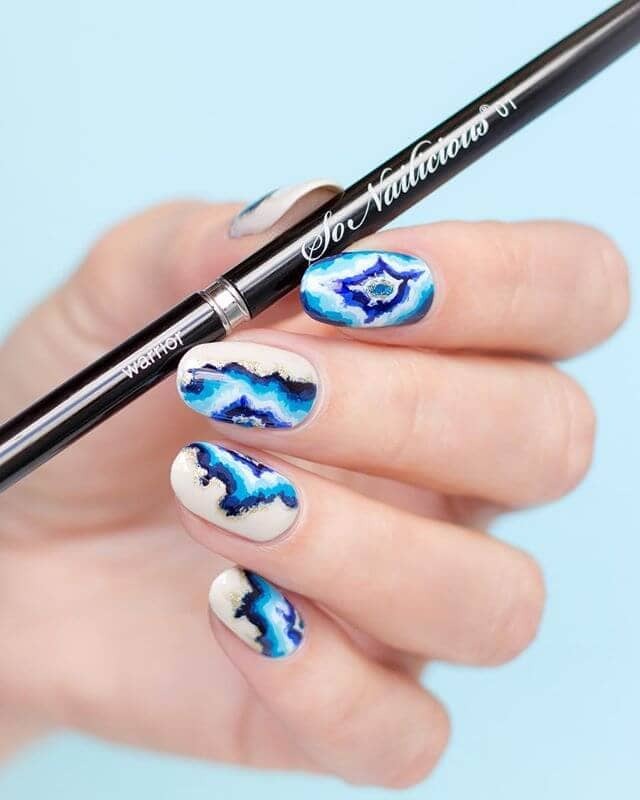 As an accent, they incorporate a gorgeous silvery blue marbled nail that ties the whole package together. 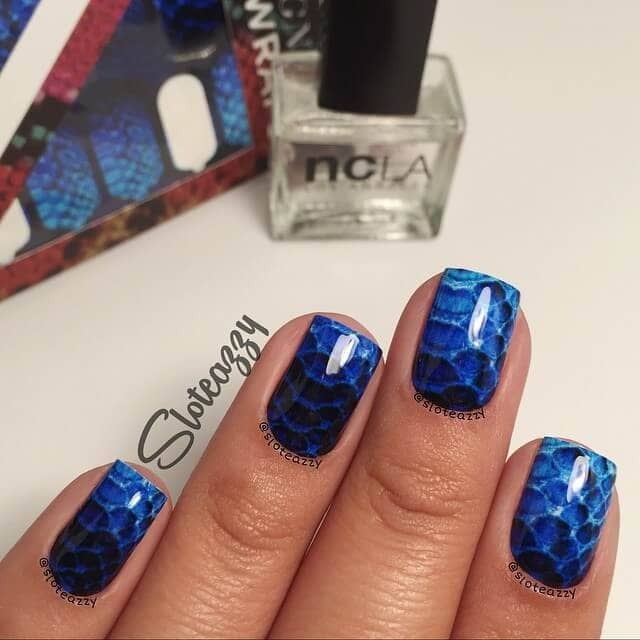 A slight ombre from nearly black to bright blue adds to the mysterious effect of these reptilian-inspired nails. The high gloss gives the surface a similar look to a smooth, rich snakeskin, and the bright blue is reminiscent of the tropical serpents of the deep jungle. But unlike their slithery counterparts, these nails don’t bite. 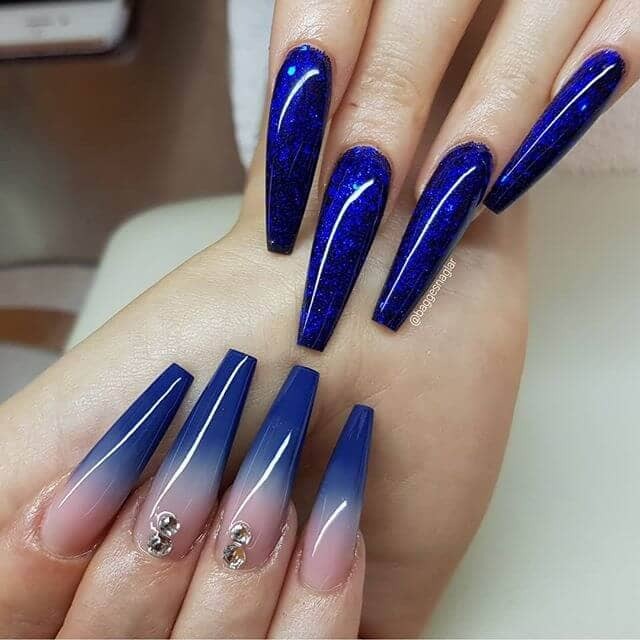 The light plays off of these nails in such a way that it almost creates stars and moons in the natural curves of the nail. The mixture of blue hues is reminiscent of an evening sky over the ocean, and the slight glitter looks like the stars just starting to peek out in the twilight. A creamy white serves as the exterior element of this incredible cracked geode nail design. The two center nails work together as a single unit, while the other nails all offer different looks into the marvelous nature-inspired look. 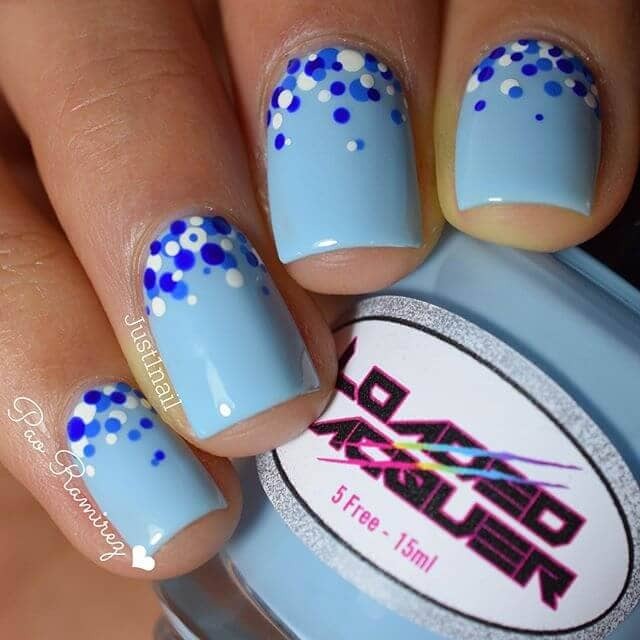 Bursting with bright blues of all shades, these nails are great for a creative and artistic look. A deep hue and a bright sheen create a juxtaposition of light and dark in this look. There is an almost indistinguishable fade from the brighter tip to the slightly darker base that adds an element of depth to this otherwise fairly straightforward look. The high gloss finish lets the nails generously reflect the light for a brighter side to these nails. The juxtaposition of feminine and delicate with bold and metallic creates a look that pulls off everything all at once. The bright and shiny metallic blues stand bold and futuristic against the matte pastels of the other fingers. A shiny rhinestone accent ties this look together and adds an extra element of style. Whether you are supporting your favorite sports team or simply sporting your favorite color, this super glossy look makes for a fun and playful choice. The faux sheen creates texture and depth, while the otherwise solid blue makes a bold statement. 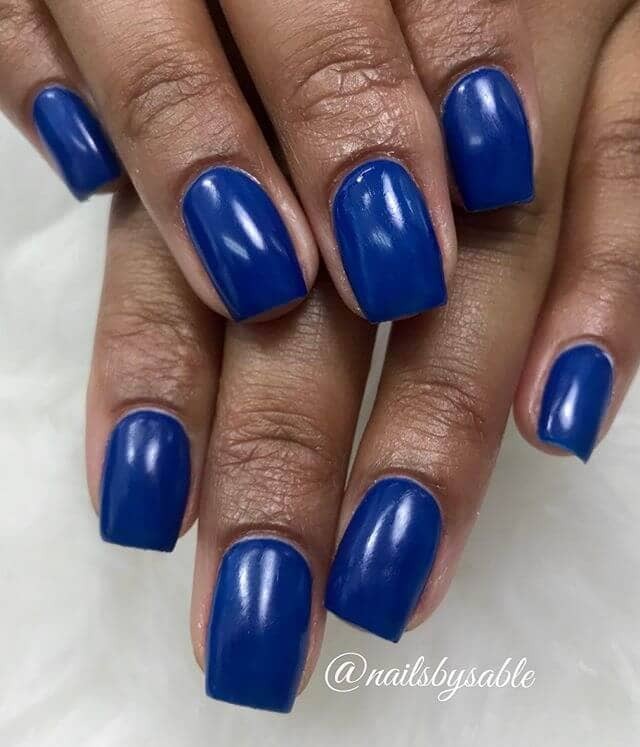 This is one of the best blue nail ideas for anyone looking to simply show off their favorite color. Reminiscent of the opening scene to Saved by the Bell, these festive and slightly funky nails are pure joy. The white solid zig-zags break up the blue glitter so as not to overwhelm, instead of creating a perfect background. Wear these for your next birthday bash or out for a fun night with your friends. 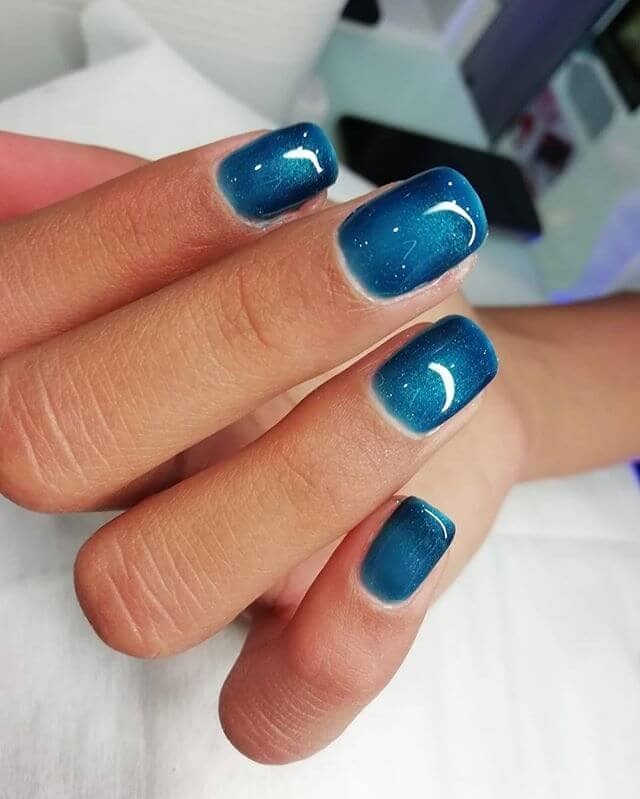 Resembling beautiful and colorful sea glass, these nails maintain a single ocean-inspired color palette while mixing and matching different styles for a varied yet cohesive look. 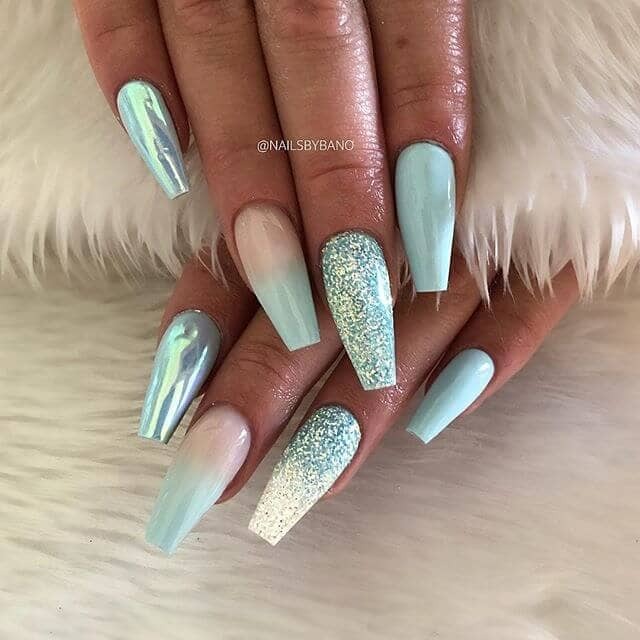 Wear these nails when you want to feel like a magical ocean princess or for a fun and festive special occasion. 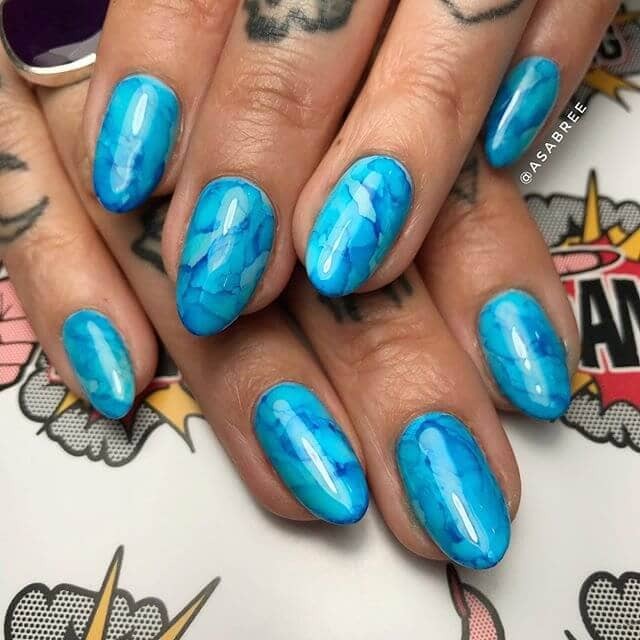 These light blue nails feature dark blue veins that resemble both wet ink lines and marbled stone slabs. However, you view these nails, their variety of tone and depth create an interesting cracked look that is simple enough for day-to-day wear but interesting enough for a night out. 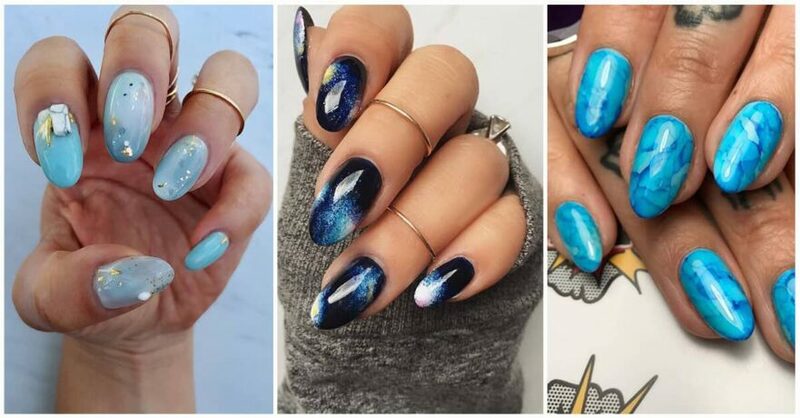 If your blue nail ideas are for an out-of-this-world upcoming event, then these nails are the right choice for you. 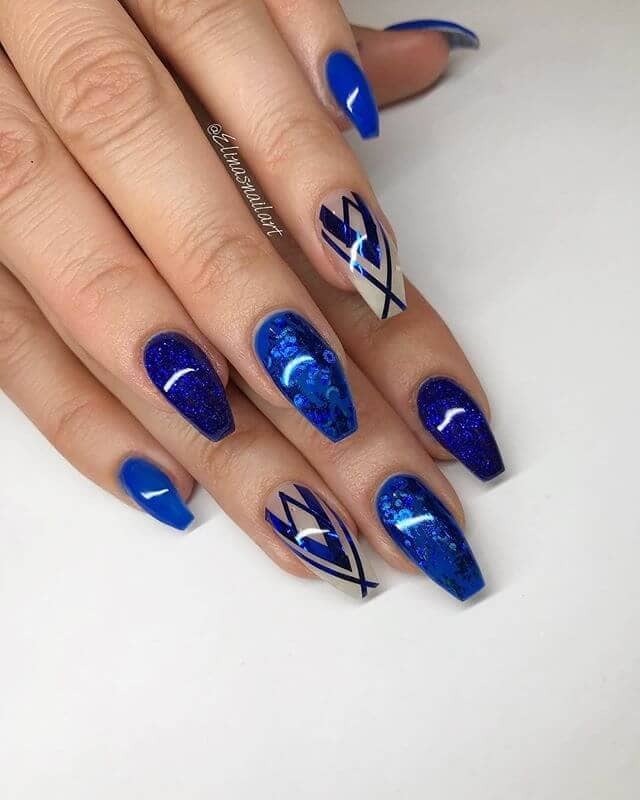 This blue nail art features a middle nail that is bursting with sparkles, two more moderate nails that have a few sparkles but also some solid coloring showing through, and two that are smoothly colored to capture the best shades of an evening sky. If you are planning to create a look that incorporates a single pop amongst a fairly standard set, then consider a design like this. It is often best to choose your accent nail first and select one of your favorite shades represented in the look to color the rest of your nails. This creates an overall cohesive look. 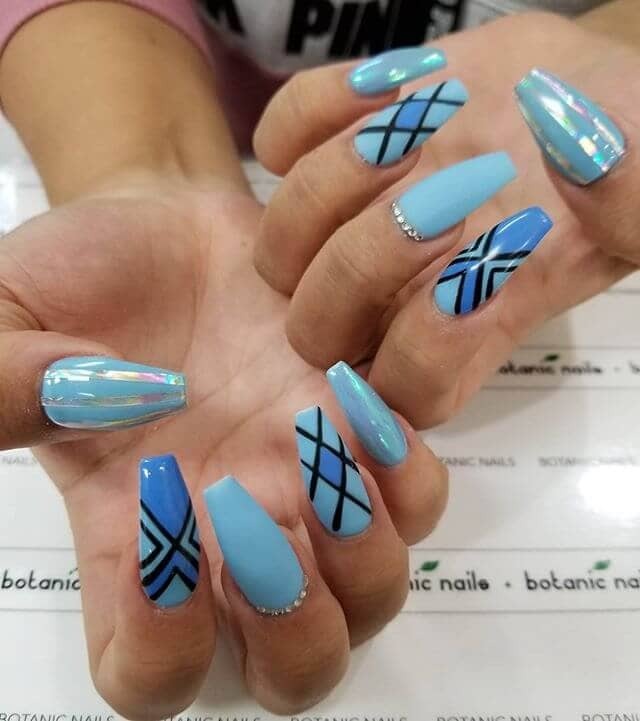 One way to show off all your best blue nail designs is to consider creating a look with a single theme that boasts all different nails. This particular styling holds strong to a dark sapphire gemstone and silver theme, and although each nail is unique, they all go together seamlessly. Using this strategy, you can create varied but congruent designs. 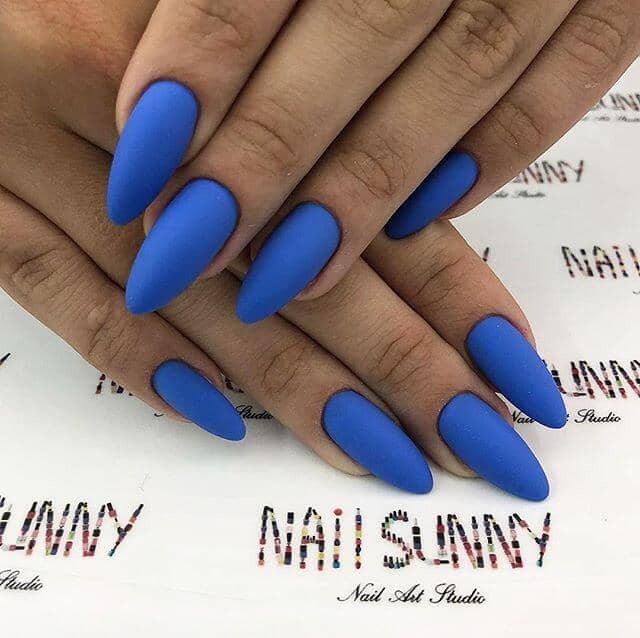 After you have been thinking about blue nail designs all day, you will surely come up with some great ideas. The problem then becomes how to incorporate them all. 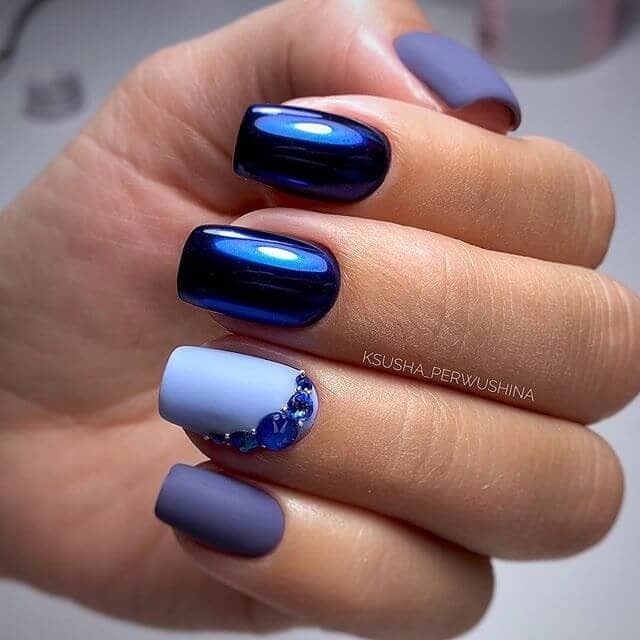 With a look like this, you can show off two stunning blue nail designs in one go. The blue is enough to tie these two otherwise unrelated sets together for a fun Jekyll and Hyde look. 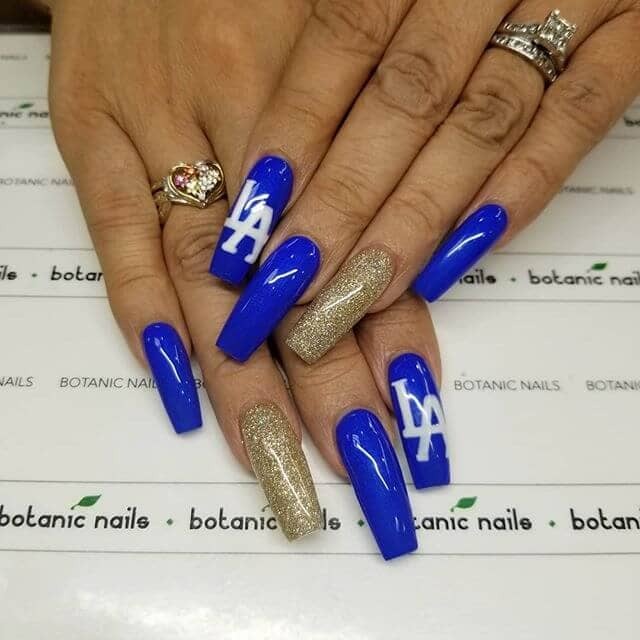 When your favorite sports team also boasts your favorite colors, go big and show off your team spirit with awesome blue nail art. The L.A. Dodgers happen to have an excellent true blue as their primary color. Pair this homage with a gold sparkly nail for the spirit and its root, root, root for the home team. 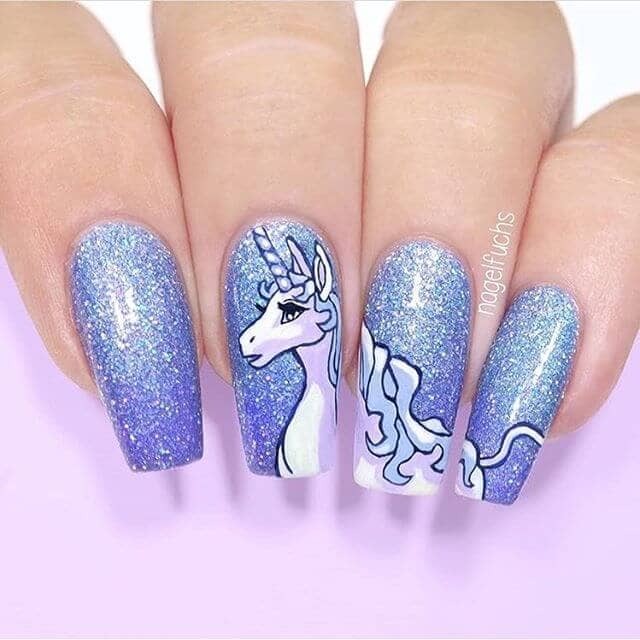 They say that fashion can tell a story, but that takes on even greater meaning with this enchanting design featuring a unicorn displayed over three panels. While the glittery background and unicorn character nod towards the youthful, the quality of the illustration and the thoughtful visage on the unicorn’s face elevate this to a piece of miniature fantasy artwork. 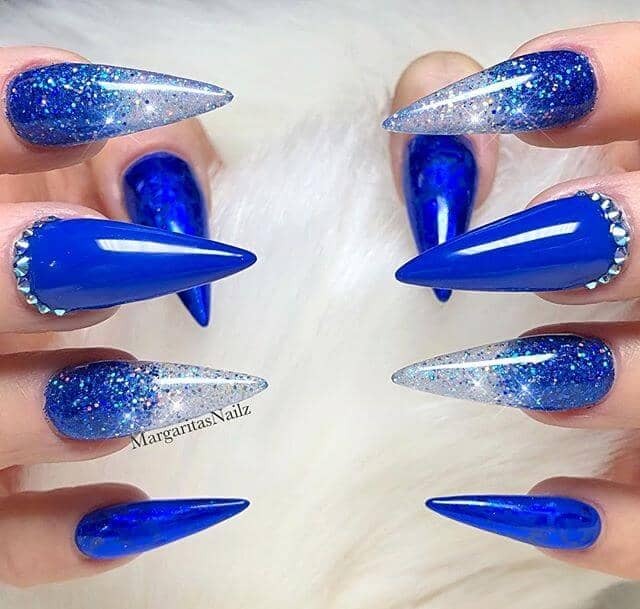 One of the best ideas for blue nail designs is to maintain a consistent color theme, but go wild with different applications. This look does that perfectly. 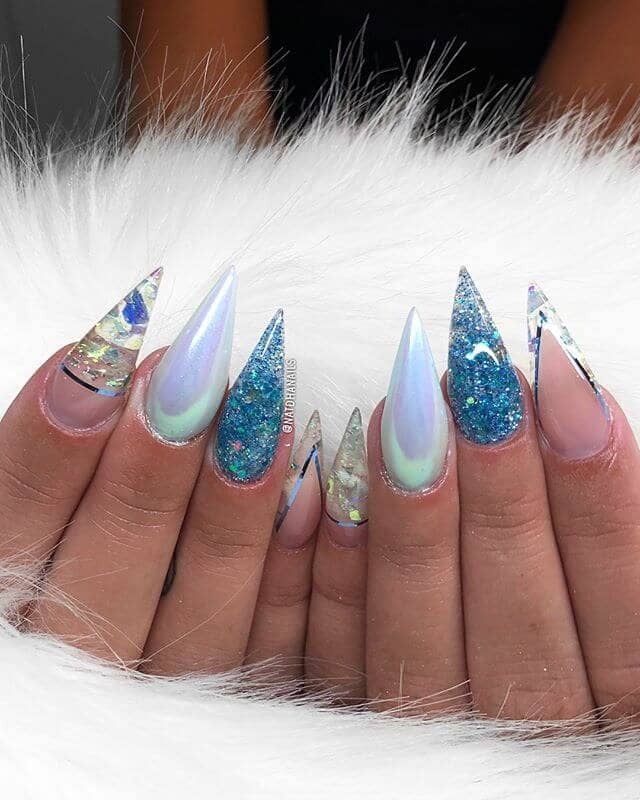 Boasting a metallic nail, a gentle ombre, a glitter stunner, and a single colored glossy nail, this look is a perfect display of balance, fun, and creativity. A holiday-themed look that strays from the typical reds and greens is so refreshing. This one, with its perfectly placed gold foil stars and bright dark wintery blue, is entirely seasonal while still being unique. Great for your next holiday party or just for everyday winter wear, try out this look as soon as you start to see those first flakes fall. 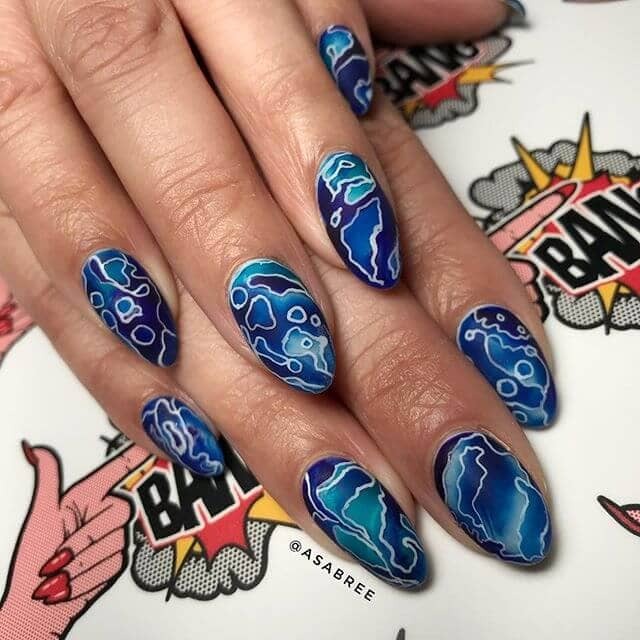 With the appearance of waves rippling out from these two accent nails’ epicenters, this blue nail art is the pinnacle of cool. You can imagine the rings as water rippling after a droplet has hit its surface – or maybe it is soundwaves vibrating across a speaker. These stylish matte nails, like great art, can represent different ideas to different people. Clean and polished, this look is the perfect balance between girly and sophisticated. With tiny dots that resemble fizzy bubbles, there is an elegant simplicity here that is enhanced by the flawless execution. Creating layers of paint can be tricky, so be sure to be prepared with the right tools, and have patience while each layer dries. 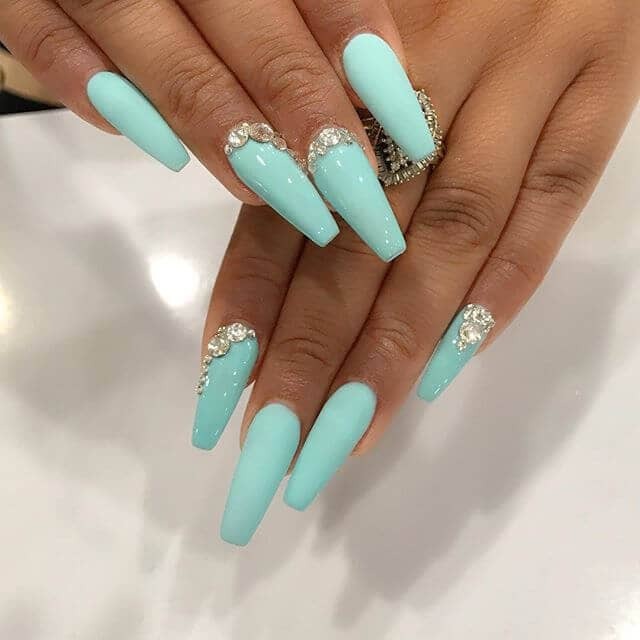 These nails are perfect for an easy everyday look and would also serve very well as the “something blue” for a wedding. 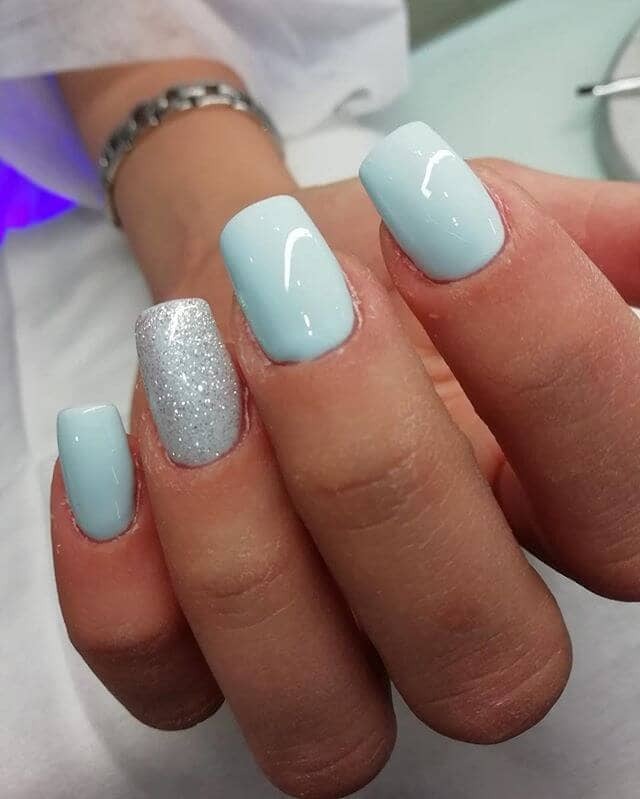 The light silver glitter accent nail painted over the consistent Tiffany blue base color is simple and sweet and could work for anyone. The elegant square cut and solid shiny polish create a romantic, lighthearted look. An ultra-dark blue reads just as classy as black, but with a bit more personality. 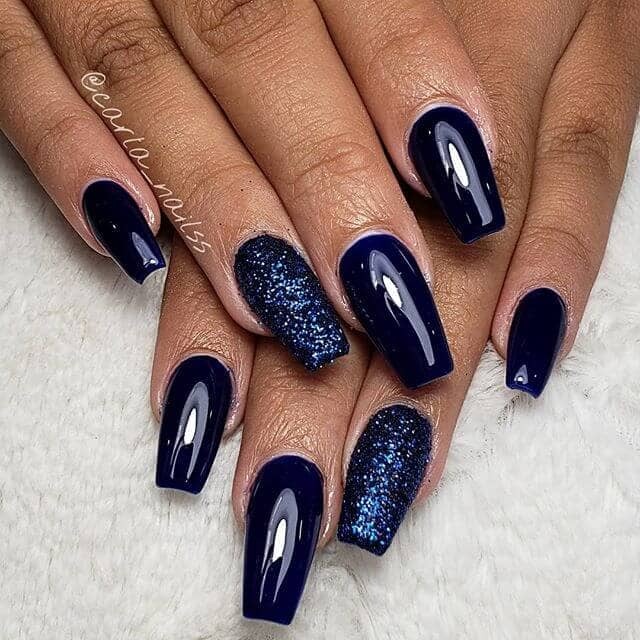 Blue nail ideas often involve bright colors, but the use of this midnight blue is divine. 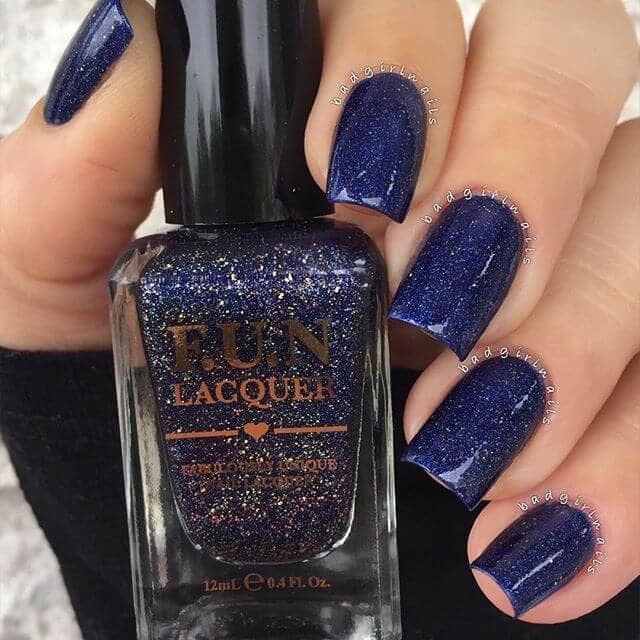 The glitter accent nail gives this otherwise serious look a slightly playful touch that is well suited for a gala event or fancy date night. It is hard to beat the natural beauty of the galaxy. 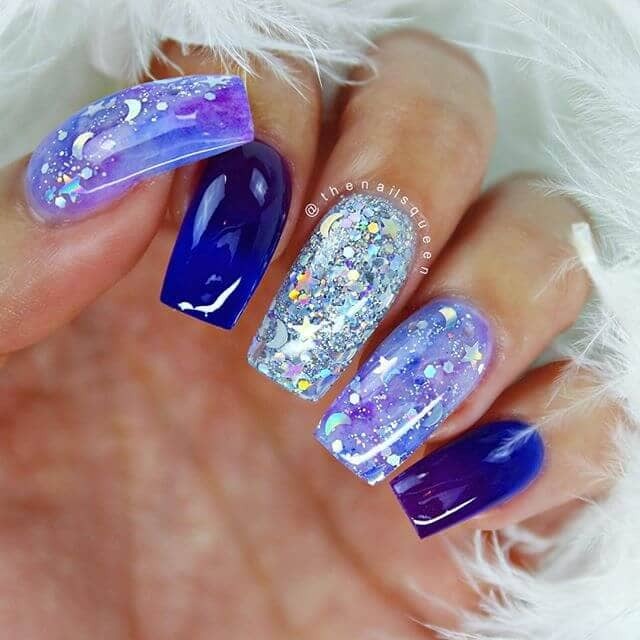 These nails represent the swirling and magical blues, whites, and purples of the Milky Way for a stunning intergalactic design. Beyond the awesome design and color work, this piece features cute diamond rhinestones sprinkled throughout to represent bright shining stars. 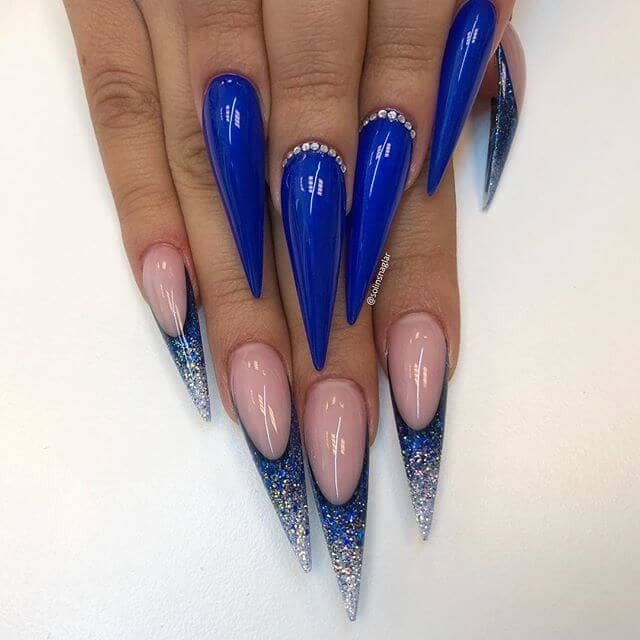 To create nails with this much impact, it is important to think through your design. These awesome nails were carefully constructed with a plan for every color, shape, and tone. The mixture of matte and glossy nails creates multiple textures, and the use of foils and rhinestones adds sparkle. With patience and a good eye, you can recreate this look on your own. 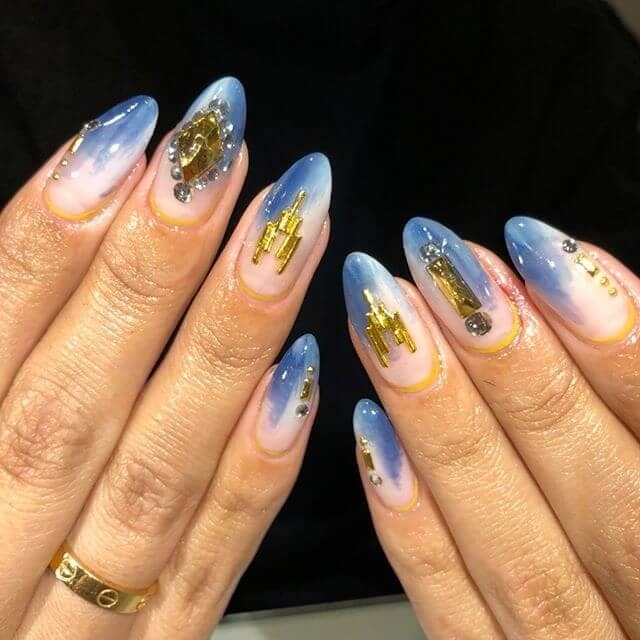 Bearing a strong resemblance to maps of the South Pacific, these super modern and artistic nails create a graphic style all their own and will always stand out. The wavy loose pattern ties these nails together, giving you the feeling that if you just follow the lines you could navigate your way home. 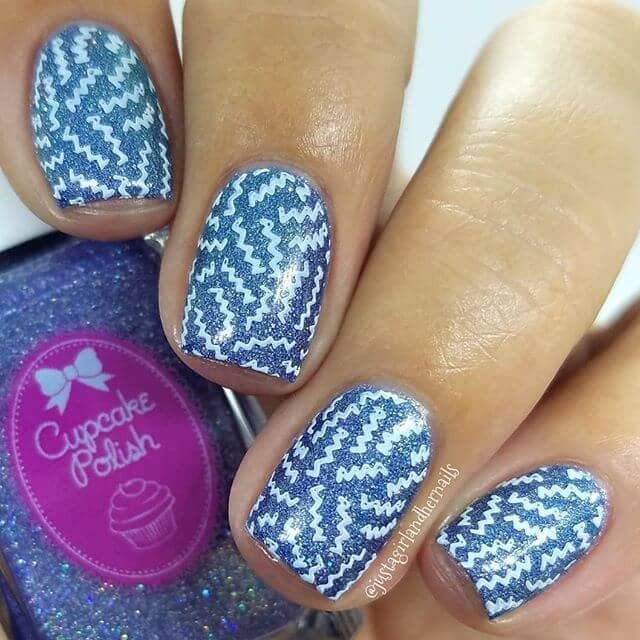 The gorgeous watercolor blue tips on these pretty nails create a gorgeous skyline effect. Pair this with gold and rhinestones highlights, and you get a look that is reminiscent of a bright shining cityscape. The soft nail shading paired with hard metal accents creates a dynamic and memorable look. These nails are sheer perfection. They are great for any skin tone, can go with many colors and styles, and are easy to achieve. These nails are for the woman who loves having her nails done in her favorite shades but doesn’t want to spend forever at the salon. Rock these nails for day-to-day wear. Although great as an all-over color, sometimes it is fun to play with blue as a stand-out accent. 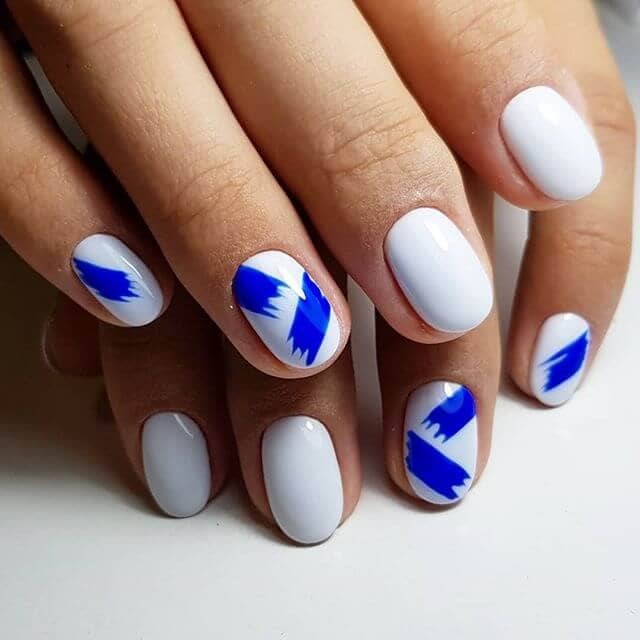 These brush stroke style nails playfully sweep your favorite blue over a chic and simple glossy white canvas for a look that is cool and modern. Keep these nails in mind when you are feeling whimsical and looking to have a good time. 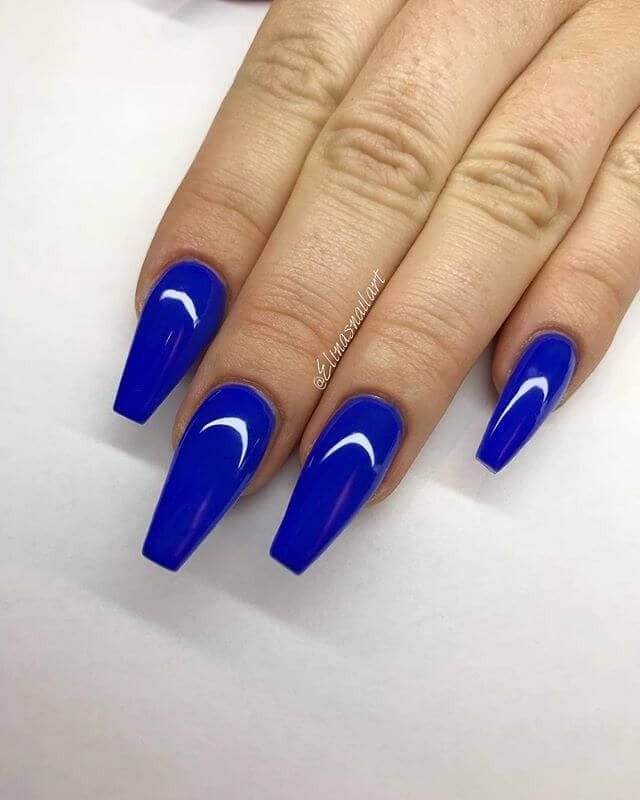 One of the best features of simple blue nail ideas is the fact that you can change how they read based on the rest of your styling. Wear something sweet and feminine to make these nails look cute and sweet, or pair with your best jewelry and favorite dress to create a more chic look. Adorned with flotsam and jetsam, these nails look like they just washed up on a magical tropical shore. The aquatic blends are a consistent and reliable base for whatever fun décor you decide to use to bedeck your nails. You can keep it simple with just a sprinkling of glitter and a few accents or go wild and load on the accessories. Sometimes it can be nice to display your beautiful, healthy nails beneath your fancy acrylics. This look allows you to do just that without losing any style points. 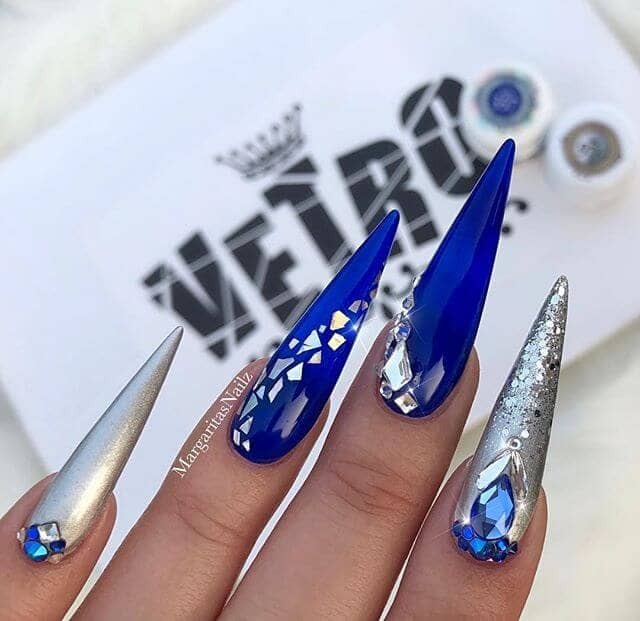 With one hand full of solid blue knockouts and the other with sparkling glittery blue and silver tips, this look has it all in one. 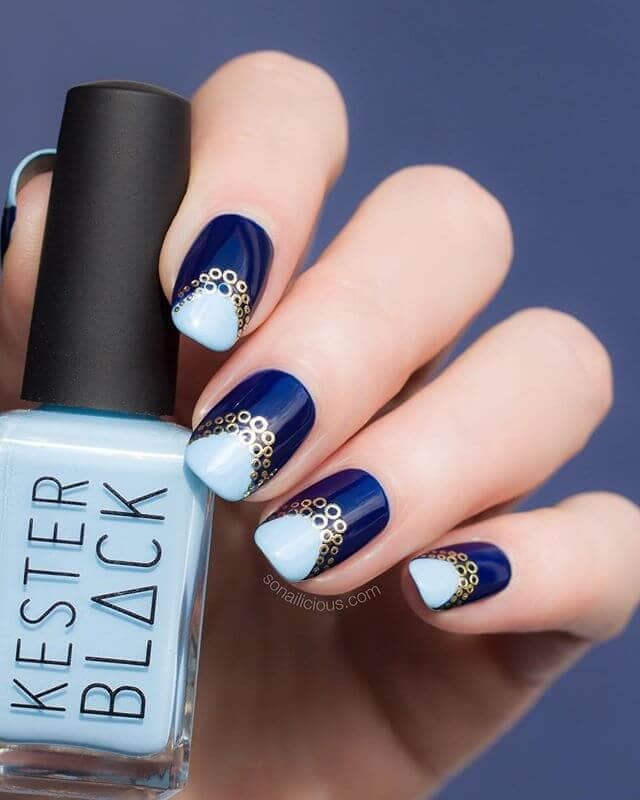 Creating designs can seem intimidating, but if you start with easy blue nail ideas like this, you can get the hang of it in no time. Pairing a metallic silver with this gorgeous solid blue is a great idea for creating distinct lines. Start simple with just two lines and work your way up to the intricate design of the accent nail. This blend of fun and funky blue nail designs has an almost ethereal and otherworldly impact. Grounded in reality with the solid blue pinkie and thumb, the other nails either embrace the heavens with multi-colored art or create bold sharp shapes with strategically placed metallic blue foils. The impact of leaving the undercoat of the foil nail blank is totally awesome. Sometimes you don’t need to be flashy to make a statement – though it does help to be glittery. The charming mix of blue and silver hues is tied together by the tightly compacted glitter, giving the illusion of texture. Rather than drop a pretty dollar at the salon to get glitzy nails, you can recreate a glamorous look like this one from home. With a solid blue sparkling base and tiny flecks of a darker blue, these pretty and easy nails remind one of a delicate robin’s egg. Great for the springtime or whenever you want to bring a smile to the faces around you, wear these cute nails out and about or to a fun, relaxed garden party. 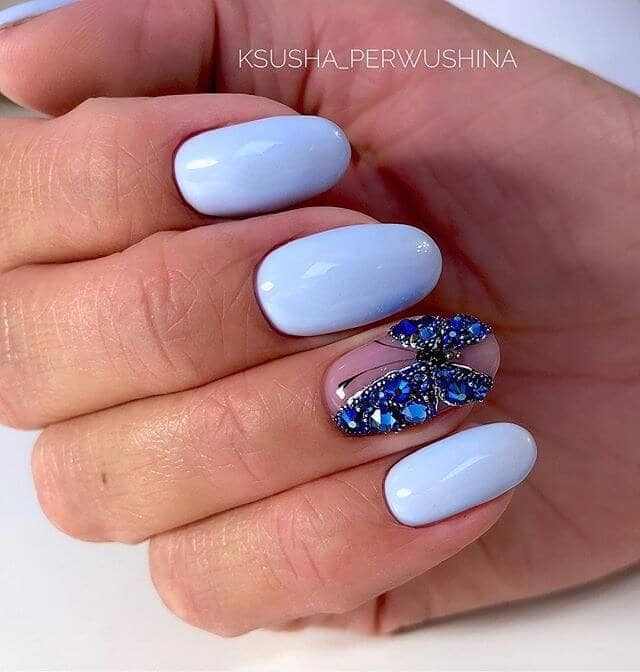 Sweet cornflower blue nails gently set the stage for the centerpiece of this look, a beautiful blue crystal butterfly charm. The perfect balance between quiet and spirited, these nails are a great way to welcome in spring or remind one of sunnier days ahead. The almond shape curves just right with the butterfly wing, and the clear base makes it stand out even more. If you ever look up at a clear night sky, you might think that the heavenly canvas is one solid shade of bluish black, until you realize all the variety, texture, and many points of light scattered throughout. Recreate that same dazzling effect with these nails, which use subtle gold and silver flecks to augment the midnight blue base tone. The narrow squared top of a ballerina cut can be tricky to pair with other angles, but these nails manage the task with ease. 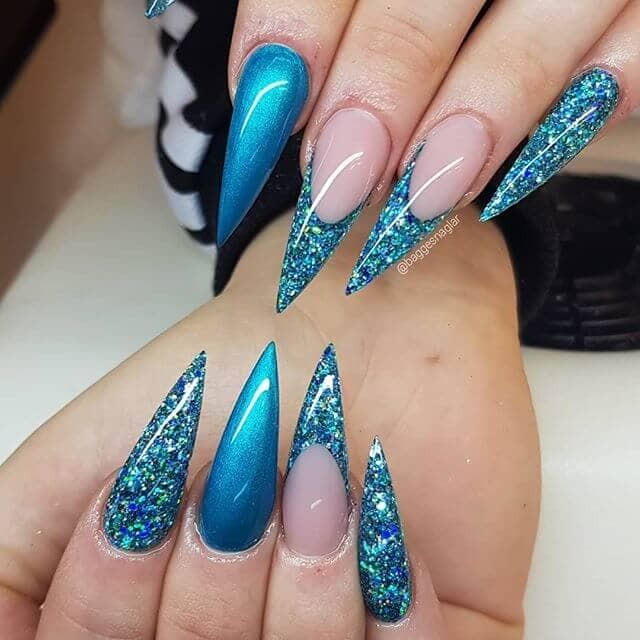 The sharp triangular point within four of the nails gives an illusion of a nail within a nail and makes the iridescent blue tip stand gracefully apart. 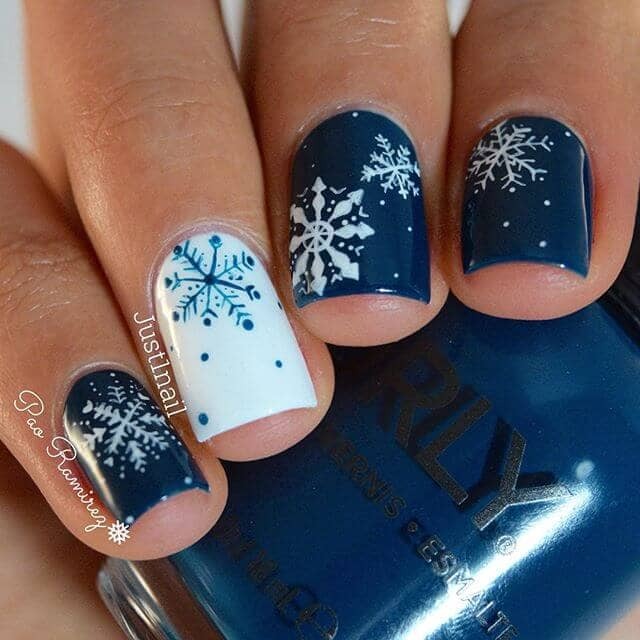 This design is the epitome of a holiday look, showing off a cute and delicate snowflake on each and every nail. Inverting the navy background and white snowflake on the one accent nail is as clever as reversible wrapping paper. 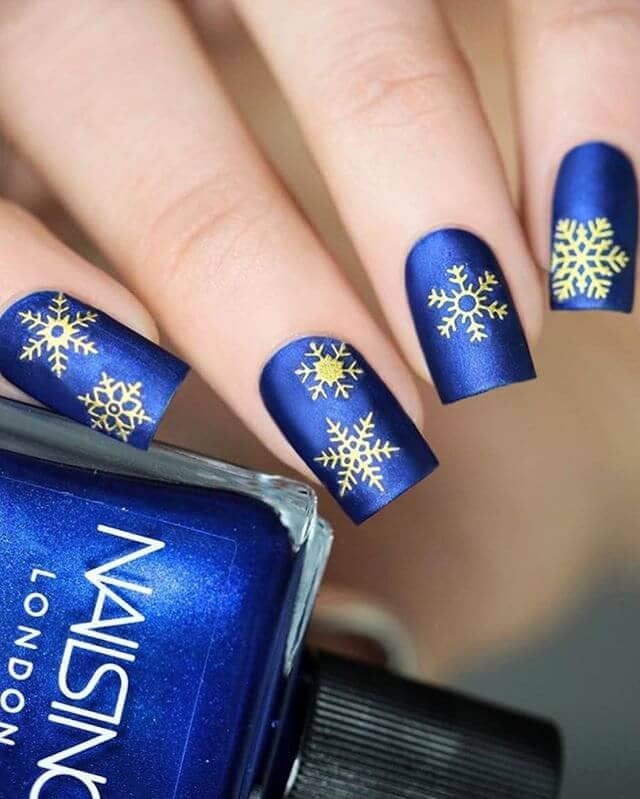 Plus, if you customize the top-layer illustration, your nails will truly be as unique as the snowflakes falling around you. 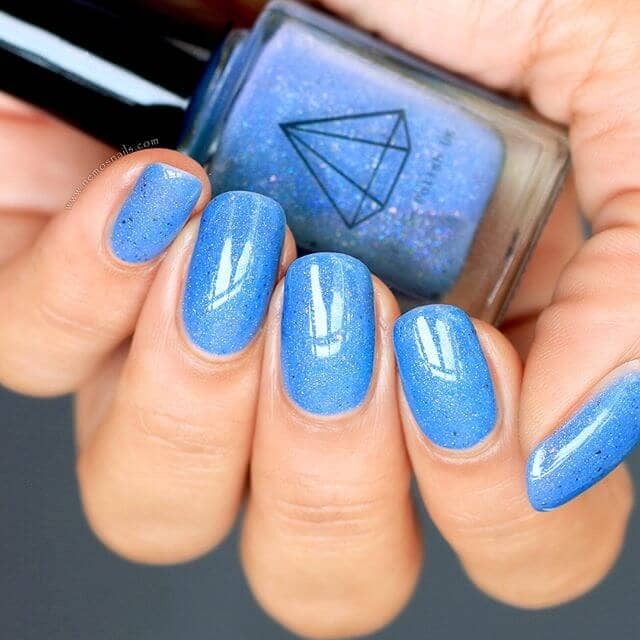 A very pretty blue nail idea is a gentle ombre. This look always ends up evoking sea or sky, exuding warmth and relaxation either way. Choose whatever two blues you like to blend together, and don’t be afraid to experiment with colors. The further apart your starting and ending colors, the more dramatic the transition. a subtle nod to the French manicure. Instead of plain white, it uses a very light, almost snowy blue. And of course, these nails forgo the glossy clear base, replacing it with a dark blue foundation and artsy clusters of gold circles. Every nail is an individual piece of art with this set of fun nails. 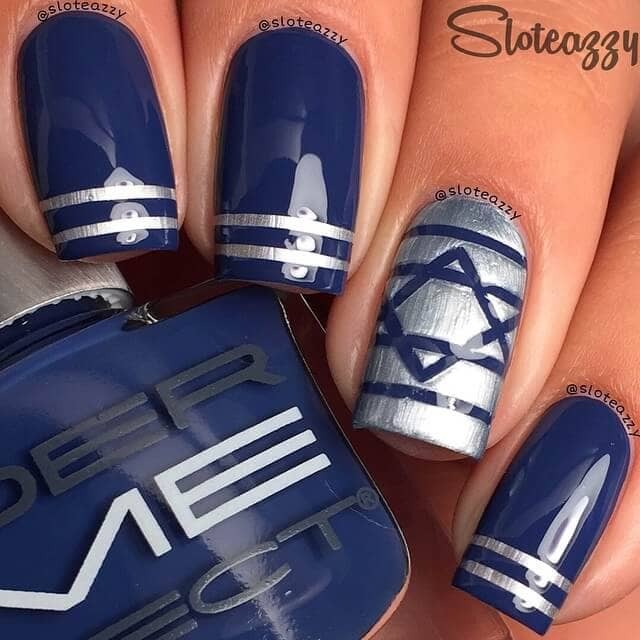 The use of cool blues and silvers tie this look together, and although each nail is very different from the others, there is an intangible cohesion that just makes it work. Mix up which nail gets which design on each hand for a playful variation. This look not only utilizes the popular and lovely gentle fade effect but also incorporates pretty and intricate gold leaf designs. Mixing angular lines with natural laurels, these nails have it all and can easily be modified to be worn for any occasion. Complement these nails with your favorite gold jewelry. This look plays with the blue theme, spinning out three dazzling designs that each outdoes the last. The outer nails sport a dappled blue that looks tame next to the glitter bomb of the second and fourth fingers. The middle finger takes the cake, though, with a solid blue base and a bejeweled bed of diamonds. 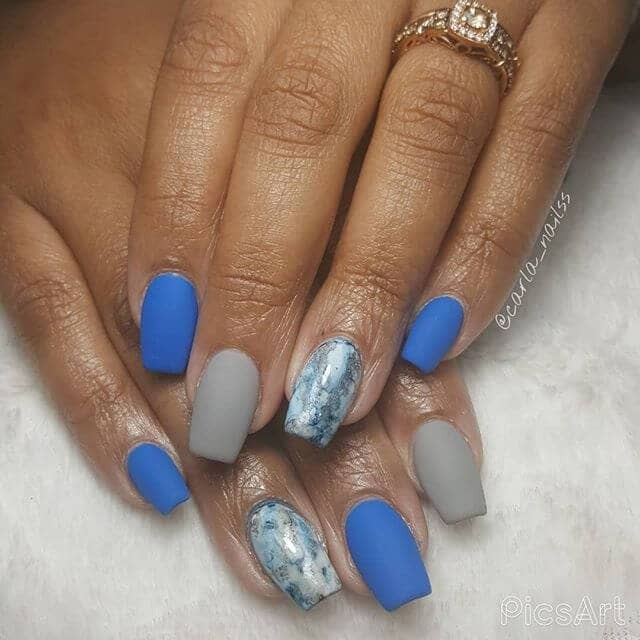 These nails take three of the absolute greatest blue nail designs and bring them together for a single show-stopping look. Each nail is sheer perfection on its own; when combined together, they create a look that incorporates classic nail art designs seamlessly into one fabulous display. When creating a look like this, getting the colors just right is key. 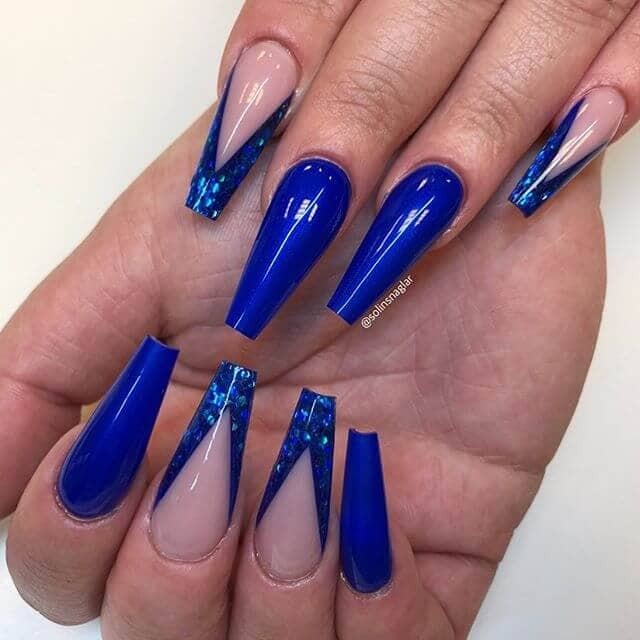 Blue nail designs are easy to pull off, including so many options, and will be admired by all. There is a shade of blue for every mood, every tone, and every personality, so be sure to carefully consider which styling, design, and coloring is best for you. If you’re in a playful season of life, go for something flirty and wild. If you’re feeling a bit more professional, opt for a classic, less ornate design. 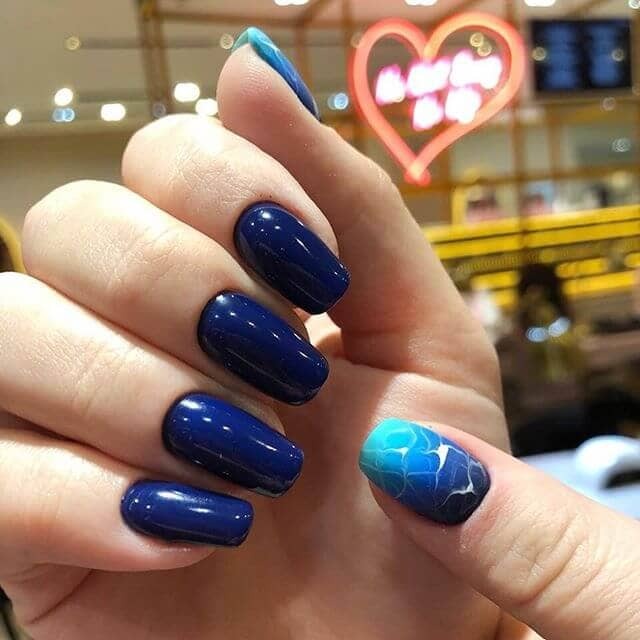 No matter your choice, embracing the timeless beauty of blue will make your nails look fabulous and will send you into the world with confidence.